I'm no architect, so it's a good thing that we get to talk with architects. At a meeting with the Atlanta Architecture for Humanity chapter, I described our hi-hat roof woes. One of the architects made the perfectly obvious suggestion of a salt box roof. Of course! I literally slapped my forehead. 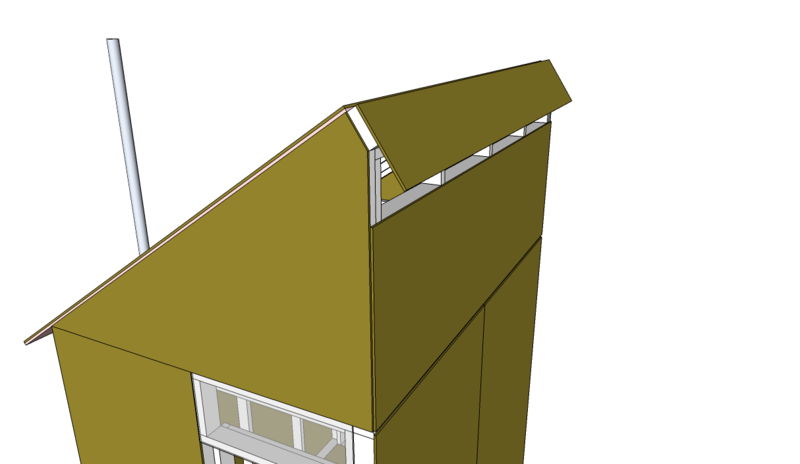 (For the other non-architects out there, a saltbox roof is where you knock the top corner off a shed roof. It has the advantage from my perspective that we can make the top angle a right angle, simplifying the manufacture of the gable pieces. This is what I've done here in this Sketchup model.) In a sense, we have a luxury that real designers don't have: we field lots of our product, and so we get to see in the field what does and does not work, and get to tweak the design as it goes. Since each unit is cheap to make and fast to produce - in an architectural sense, that is, it's still an effort for us - a design can rapidly go from half-baked to baked in a short period of time. Architects building real buildings for paying clients have to get it right the first time - we only have to get it right enough and learn for the next client.